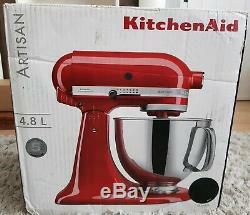 Brand new and boxed Kitchenaid Artisan stand mixer with a 4.8l capacity stainless steel bowl. Also included are the wire whip, flat beater and dough hook attachments. It's in classic black so will look great in any kitchen and never go out of fashion. There are some minor cosmetic marks to the box only. This is a wonderful machine to use - it makes light work of whatever you decide to whip up! 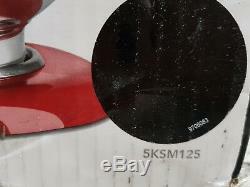 Collection is welcome or I will post using Parcelforce 48 service. From a smoke and pet free home. The item "BNIB KitchenAid Artisan 4.8L Food Stand Mixer, Black, 5KSM125" is in sale since Sunday, January 6, 2019. This item is in the category "Home, Furniture & DIY\Appliances\Small Kitchen Appliances\Stand Mixers". The seller is "loofy1998" and is located in Luton. This item can be shipped to United Kingdom, Austria, Belgium, Bulgaria, Croatia, Cyprus, Czech republic, Denmark, Estonia, Finland, France, Germany, Greece, Hungary, Ireland, Italy, Latvia, Lithuania, Luxembourg, Malta, Netherlands, Poland, Portugal, Romania, Slovakia, Slovenia, Spain, Sweden, Australia, United States, Canada, Brazil, Japan, New Zealand, China, Israel, Hong Kong, Norway, Indonesia, Malaysia, Mexico, Singapore, South Korea, Switzerland, Taiwan, Thailand, Saudi arabia, South africa, United arab emirates, Ukraine, Chile, Antigua and barbuda, Bangladesh, Belize, Bermuda, Bolivia, Barbados, Brunei darussalam, Cayman islands, Dominica, Ecuador, Egypt, Guernsey, Gibraltar, Guadeloupe, Grenada, French guiana, Iceland, Jersey, Jordan, Cambodia, Saint kitts and nevis, Saint lucia, Liechtenstein, Sri lanka, Macao, Monaco, Maldives, Montserrat, Martinique, Nicaragua, Oman, Pakistan, Peru, Paraguay, Reunion, Turks and caicos islands, Aruba.